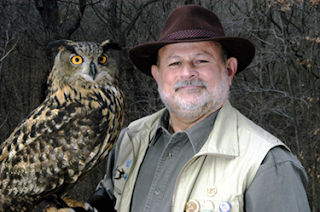 The news of the death of Walter Crawford, the Founder and Executive Director at World Bird Sanctuary is a great loss for his family, staff, the birds of prey he so loved, and our region. I had the pleasure of meeting Walter in the late 90's when I contacted his organization about monitoring blue bird houses for me at Eagle Springs Golf Course. He came out and I met with him and another member of his team to discuss their program. A nice man, passionate about is work and a great defender of birds of prey. I remember on many occasions watching Walter at ball games or riding a float at the Rose Parade with one of his great feathered friends. Tens of thousands of young people throughout our region over the years were given their first introduction to these great birds at field days to the center or to many other events in which the center brought birds for people to see. There are probably many in their 20's-40's who Walter helped give their first and best impression of these beautiful birds during one of the many children events. I'm sure his dream will go on with the dedicated staff and volunteers who are so passionate about their work. You are now soaring with the Eagles Walter! The other day if you listened to my aeration video, I made mention of doing some Bermuda eradication work in the next few days in the fairways. Today was the day so you have about T-minus 4-5 days before the fairways begin to turn off color. The course will still be in great shape to play but our fairway surfaces will be a different color. I did mention that I probably would not do 11-12 acres like I did last fall. Well, this morning as I was spraying my first 4 acre tank and it got me up to one pass through #4, I said lets jump into it with both feet. The more widespread I make these treatments, the less time it will take and then all we have to do is maintenance treatments every year. I sprayed 18 acres of fairways at about a mid-rate of Fusilade II 4 oz/acre and 32 oz of Turflon per acre. Rates might be overall slightly less since I think my rate was spraying at slightly more acreage than the chemical I mixed but that is okay. Within the next 4 days or so, you will begin to see a little tinge or off color look to the fairways. The zoysia will be slightly yellow and the Bermuda leaves will begin to turn a little purplish red. The next couple of weeks they will remain off color until the chemical after about 3 weeks has done its dirty work. The Bermuda will not die in most cases but will be suppressed. As the Zoysia comes out of its slight off color state, it will begin to show up a little stronger in many areas where the Bermuda is still weakened. Now, it won't jump out of the ground but it will begin to poke through in areas. This is multiple years work to try to gain control of our fairways back to Zoysia. You will be able to see significant reduction in Bermuda especially on the flat area of #3 and #13. Holes 4 and the flat area on 7 have also been in the rotation the longest. I think the 2nd fairway will also start showing improvement because most of the Bermuda is entwined in the Zoysia. The intermediates were not touched since we mowed them this morning and I could not see the dew pattern on the Bermuda. I might have to wait a few days to spray it since rain is predicted and higher temperatures. I spray on a heavy dew morning because the Bermuda usually stands out because it has more leaves and has a darker green tint to it. As I was applying the material on the fairways, I was seeing a lot of areas of strong Zoysia with the Bermuda intermingled. These are perfect areas to try to gain some traction. I did attempt to skip the Bermuda in drainage areas. In the next few days as the color begins to change, I will take some video and pics to explain what is happening. I will do at least 2 more applications before late fall to help push the zoysia along further and suppress the Bermuda. I can understand your concern, its looking beautiful, why tear it up now? If we become a Bermuda fairway golf course again, we could have large sections of winter kill and fairways that are not nearly as good to play off of at any time during the year. As Andy Dufresne said in Shawshank Redemption, 'Time to start living, or get busy dying'. I am choosing life for our Zoysia and death or a weakened state for the Bermuda grass. If you are interested in our past work on Bermuda eradication, click on the link below which will take you to say posts from the past. Spent a lot of time last week aerating playing surfaces at Glen Echo. Tees, approaches and finished up with the range tees this morning before the storms hit. Also used our rough aerator with slicing blades and did back 9 last week and almost got through number 5 when we had a weld break. Should finish that later this week when the repair is made. Videos below describing our work. Links attached for those who video does not come up on your screen. Picking up cores on short range tee. All hands hurrying before the storm hit on Long Range Tee. Ran across this great post from St. Andrews regarding the rebuilding Hell Bunker. Check out the blog post below. The next 30-45 days are critical to the short term health of our bentgrass/poa-annua greens. Right now our surfaces are in good shape. The concern I have about our wet green surfaces and profiles has me concerned enough to write this blog. I don't see anything at this time except for the black algae that pops up when the weather conditions are right but the overall wet condition of our soil profile and future predictions for more wet weather is not the place we want to be going into the heart of the warmest time of the year. Of course, ball roll out I know is not what you have wanted to see over the last few weeks nor have I liked what we have been able to provide. But doing anything differently could have severely compromised the health of our greens for months to come. A combination of summer heat and excessive moisture can lead greens down a not so great path. You do everything perfectly, provided all the proper cultural practices to your greens but weather sometimes just wins. This season we hope we've made all the proper moves to offset our negative weather conditions. Our temperatures have been average for the most part but the humidity and soil moisture content has been excessive in June with an all-time record rainfall. We've started out July with wet and soft greens and the prognosis for the upcoming month is not too good to help firm our surfaces. The following cultural practices over the last month has protected our surfaces from excessive wear and tear before the potential of the hottest part of the year July/August has arrived. We've skipped mowing on days when excessive moisture could compromise the health of our greens. I don't think I have ever skipped more mowing in June than I have this season. Of course record rainfall will cause that. I'm not speaking in the 3-4/10" range, I'm talking 1-2" in the last 12 hour range. We needle tined our greens at the end of May and hydrojected them at the end of June in an effort to keep them open and pushing moisture through and drying them out when it was not raining. We have not top-dressed as often but have gotten a few topdressings down to help reduce wear damage and cover the crowns of the plants. Chemical applications have been made as timely as possible between rainfalls. On some occasions I would only load 1/4 tanks to reduce negative impacts from the weight of the machine when we applied products to our greens. This is one of those seasons that attempting to get excessive ball roll out artificially is very dangerous for our turf. As conditions dry, we bring out the roller and smooth our surfaces which helps to improve ball roll out. The biggest problem we have is that the grass plants are so plump and full of moisture which causes friction and slows ball roll. There is not a lot we can do artificially because the surfaces have been so wet. Double cutting greens is not the answer, especially when they are already soft. Applied wetting agent and growth regulators to move moisture through the profile and reduce top growth. Of course reducing top growth is difficult when you had to skip mowing 3 days during a 7 days period. The guys have been double dumping their buckets on greens for a number of days. Experience has taught me to remain patient. The rains will quit and increased ball roll will be back again before we know it. Excess moisture increasing soil temperatures in greens reducing root growth. Excess moisture increasing CO2 and decreasing Oxygen which is most important for root survival. This condition encourages fungi in the soil and reduces good microorganisms which improve plant health. Mechanical damage from mowers, foot traffic and ball marks are larger. In the end, seriously affects ball roll out. Some disease activity could be delayed until dryer conditions occur such as summer patch which roots are infected but plenty of moisture will delay or mask the disease until dry conditions occur. Also root pythium diseases can be problematic because you have to water chemicals to the rooting area but you are already wet from too much rain. These type diseases have already been showing up in greens since spring and become more troublesome as summer rolls along. One of the things we are seeing is below normal temperatures for July. I guess if we were too wet, I would prefer that temperatures be below normal than above normal under these conditions. Temperature stress is taken out of the package which is a good thing. Roots systems could stay stronger which will help the plants offset other stress over the next month or two. Hopefully, the rain will be less frequent. Maybe we have an above average amount but the temperatures stay below normal and help you get out more frequently than you normally would during a hot July. Most Rain Ever For June 13.14"
2nd largest rainfall for a month in recorded history! Hope you have a great Independance Day. Dry weather for a few days and cooler temperatures are nice to have over this long weekend! Come out and see us! What Is The Landscape Fund? Years ago a fee was approved to charge members $25 once per year which was placed in the Tree Fund. As the years have progressed, our landscape has become dominated by trees and the need for trees has been reduced. The fund is now called the Landscape Fund and is being used to rejuvenate existing ornamental plantings on the property, planting trees as the need arises, and establishing new beds. Over the past couple of years, we have built new beds at 13 tee, the pro shop, planted 10 trees on property, established a new screen planting at 6 green and expanded/replaced two of the plantings at the back patio. Since the start of 2015, we have spent $5,000 to construct the planter boxes on the veranda, the new construction/planting at the pro shop and purchased the limestone planter for the Pearson Plaza. This fall or next spring we intend to improve the Sun-room planting bed. (we call it the bubble). Becky, our horticulturist and I agree that the Principals of Landscape Design should be emphasized and our focus should be on year round interest in our beds emphasizing form, variety, and sequencing. We hope this will provide greater enjoyment for you and the many guests who attend events at the club throughout the year. Upon my arrival in 2008 at the club, the landscape around 9 lake with the Woodland Garden on the dam side of the lake and the ornamental planting of the tee side were overgrown with weeds. Since that time we have made efforts to improve this area which is the largest total continuous planting at the club. Becky has moved plants from other beds as we've replaced plants and has worked hard at weed control. In an effort to reduce costs, we utilize chipped tree limbs that have been ground up from our property. Since this area has highly visible by both our members and guests, it is important that this area look its best. This fall/winter, we intend to start a tree nursery behind the 17th green. My thoughts are that we would establish 6-8 trees in this area which will be used to grow trees for 5-10 years and then contract with a company with a large spade to move these trees to areas where trees trees are significantly aged or compromised. A golf course architect, superintendent and green committee will be involved in the placement of these trees and a majority of trees planted in the future at this club. Our goal is to keep green and tee complexes in as much full sun as possible and to improve sunlight to fairways whenever possible. Some of this work can be completed by not fence lining trees but staggering trees so light can enter these areas for longer periods of time. Also understanding the path of the sun in all seasons and the shape and size of grown trees is important so that turf grass and trees can co-habituate peacefully without a caretaker like myself wanting to remove the offending party! Placing 80' trees on the east and western exposure of a fairway will lead to a shaded and weakened fairway. You will wonder why there is very weak zoysia and I will be praying for lightning to help me remove the tree.